Although the government prohibits the practice of religions that may affect the stability of the communist party, there is a deep sense of ritual that continues regardless of the restraints. The majority of people are Buddhist, but in most cases a local hero, the female goddess, a past king, have supplanted the Buddha Iconography. Most towns and villages have a Pagoda, where one of the above is worshiped. On one particular visit, four elderly locals who maintained the building invited us in for green tea and oranges. Of burning interest to them was how old we were and if we were married, this is a very important issue, which I will fill you in on later. The Vietnamese are extremely warm and curious people and will smile generously to compensate the barriers of verbal communication. There is also a strong catholic community in the south and central area emanating from the period when Vietnam was colonised by the French. On our journey to Dalat (in the central region), Virgin Mary’s were prominently located on the balconies and crosses dotted the mountainous terrain. 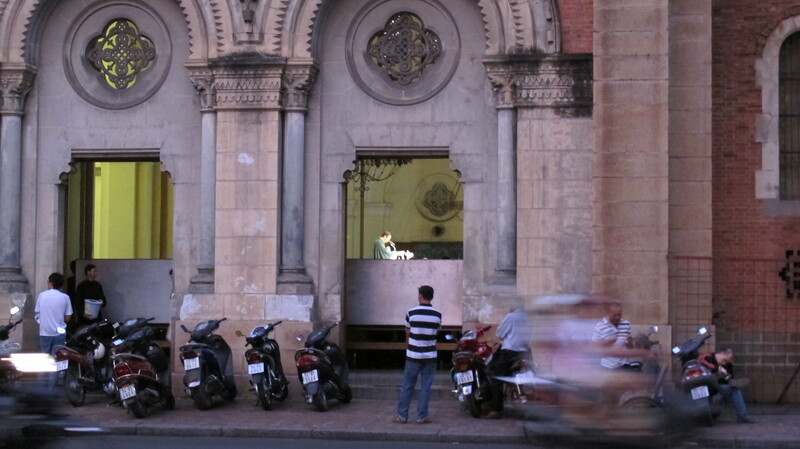 During my stay in Hanoi, I witnessed the procession of a Christian funeral. Walking in front of the hearse/bus was a woman holding a cross, who was closely followed by a man holding a black and white picture of the deceased. A jubilant brass band in white uniforms was followed by the bus/hearse, which contained the large casket, with the family seated inside around the coffin. Mourners followed behind with white bands around their heads, dressed in the universal expression of grief. Another bus followed closely behind with extra space for the primary mourners. On witnessing this familiar ritual, I considered the human response to grief is both universal and all-consuming. 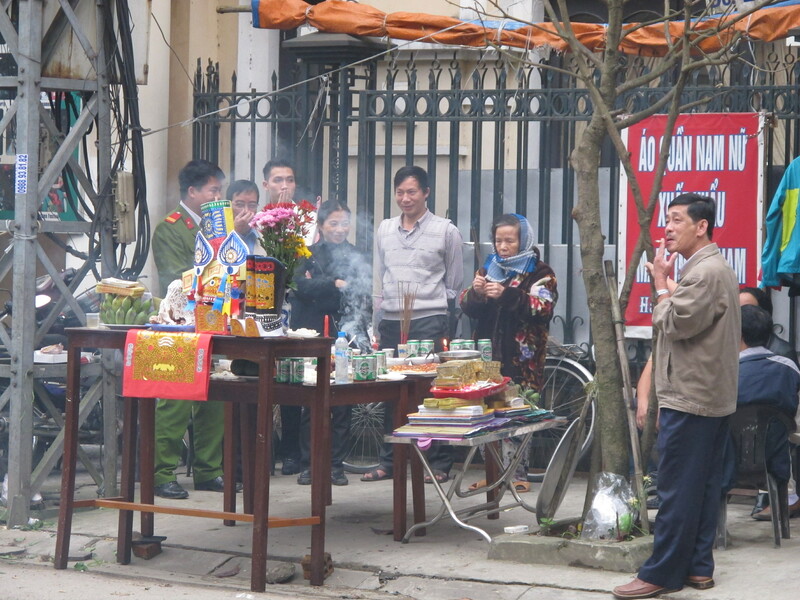 Our journey to Vietnam coincided with the most significant celebration of the Vietnamese year -Tet. This marks the beginning of the lunar New Year and celebrates the beginning of spring. Decorations vary from north to south depending on the climate, but the spirit and meaning is consistent throughout. Similar to the Chinese New Year and our Christmas celebrations, this is the time for returning home to the family and enjoying the fruits of the land and gambling with lucky money. What makes this celebration different is that the ancestors are at the heart of the festivities. Every house and business has a shrine honouring and remembering them, with their pictures hanging, incense burning and offerings of fruits and special gifts. Worshipping the ancestors occur every day, but for Tet, their graves are visited and cleaned and their invited to celebrate Tet with the family. Curiously, these tombs are located in the rice fields of farms, so as you pass through the landscape these tombs pop up through the horizontal watery plains of like mystical coffin boats. Tet is differs from our Christmas celebrations, as people can enjoy extended time with their families, having picnics and bountiful fruits and the flowers of spring. They don’t experience the bare and sparse winters that we do, with the focus on the fire and the warmth of the hearth. Flowers lined the main streets of Saigon and citizens take hundreds of photos posing in a variety of practiced ways. The Vietnamese are not camera shy. Clearing your debt and cleaning the home are key elements in the preparation, with the street sellers offering dusters made from chicken and rooster feathers in the run up; those with little means waste nothing. Unfortunately, we were also warned that there is also an increase in crime leading up to the event, people I guess desperate to provide the best for their families, but we personally didn’t experience any incidents and felt extremely safe. Homes in the North and central region are decorated with kumquat trees, and those of the South with yellow blossom trees. Measuring four-foot these trees are mostly transported on the back of motorbikes, along with anything else that will fit; the wife, kids, granny, a computer and even a full carcass of a dead pig, certainly a variation of the Christmas tree sticking out the back of the car. The rice harvest in the north finishes a month or so before Tet, giving people time to enjoy the fruits of the field and doing the preparation for next years crop. Food plays a central role in the event and a special cake is prepared called ‘Bang Chung’, which is tightly packed sticky rice with meat or bean fillings wrapped in dong or banana leaves. According to folklore, the square-shaped cake represents the earth and the circular one the sun. The preparation can take several days and the stories of its meaning are told to the next generation as its cooked overnight. Tet is a time for extended social exuberance, playing cards, gambling and relax in the warm days and nights. Even before the beginning of the Tet holidays, I witnessed the everyday social scene of street corners covered with people sitting down on stools, drinking tea and eating seeds. The air was filled buzz and chatter, this is the social life that the students can afford and relish. During Tet, we tried to relax in a café in Dalat- known as the Paris of Vietnam. We wondered as we sat in a crowded café, adjacent to a busy road with horns beeping and music blaring, overlooking a manmade lake filled with swan shaped peddle boats, if the Vietnamese relish in the proximity and intimacy of being all together? In this chaotic atmosphere, we desired a quiet café with some gentle jazz in the background, maybe overlooking the diminishing light on a natural water of body. The culture of community is certainly different to ours of individual serenity. Not everyone is able to celebrate Tet to its fullest, everyone that served us during the festivities had drawn the short straw and were obliged to share the occasion with us – the outsiders. By far the hardest workers at this time are the Vietnamese women, with complicated meals to prepare and serve, relatives to be satisfied and all this after any day job that she might have. Although Communism liberates women by giving them seemingly equal opportunities, they are still required to fulfil the traditional role expected of Woman. 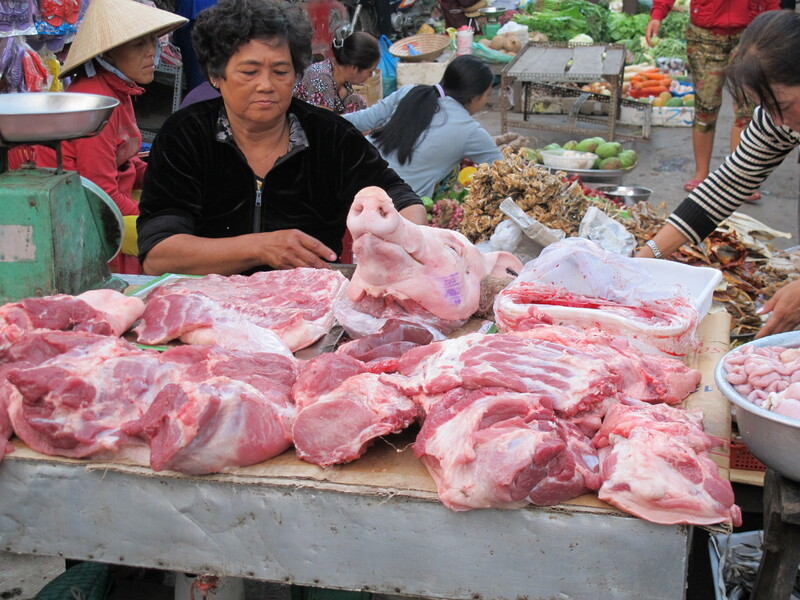 In all my travels, by far the most tenacious group of people I have encountered are the Vietnamese Woman. Unfortunately, the male counter-parts eclipse their force. Women are prepared early in life for what will be expected of them. They help their mothers with the cooking and cleaning and serve their brother’s and father’s their meals. Sons are also more revered, with a man only achieving respect and place at the village top table once he has had a son. Having a son also means that there will be someone to look after you in your old age, as daughters are required to live with the husband’s family once married. Marriage is extremely important and finding the right partner who will be approved by the family. It is best if the daughter finds a husband 5km from her home, but as she gets older (over 25) the radius increases, and if she gets to the age of 30, she can choose a man from anywhere, as long as she get’s married! If the parents of a bride and groom are influential people, it’s extremely important that you accept an invitation to their wedding and give generously (cash only) in gifts. This information is all recorded and kept for consideration by the father for future reference. During the war, woman played strategic roles, while posing as simple farming peasants during the day; by night they delivered ammunition, messages and supplies. Present day women are highly educated in the cities, well dressed, but still cling on as passengers on the back of their male driven mopeds, this image for me symbolizes their lack of control and obedience to the tradition. It’s expected for women to start raising children in their late twenties as it is widely considered dangerous to do so after thirty. Another challenge for woman starting families so young, some are at the beginning of a burgeoning careers, is that paid childcare is mostly untrusted, with women expected to step back and prioritize their families, resulting in the slim possibility ever progressing to roles of seniority. Although communism allows equal rights to work, women are also expected to look good, get married in early, start a family before they’re thirty, look after they’re relatives and still have time to have a career! Even within these constraints, I encountered an extraordinary diverse range of women with the common ground of pride and hard work ethic. The following are a few portraits. 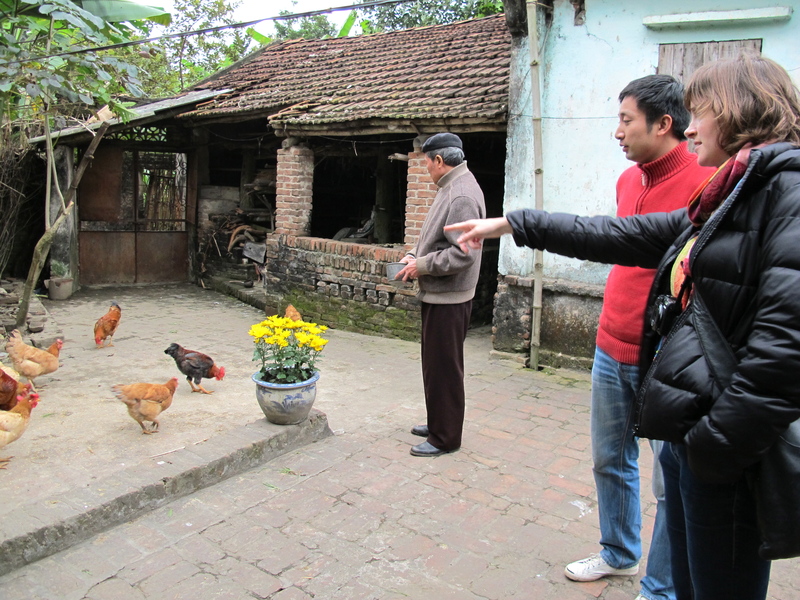 We drove down the small lane to her house; she curiously came to the gate, not recognizing our Vietnamese friend initially. When she realized the purpose of our visit, she linked our arms and led us into her home to sample the tea; she even gave me a pat on the bum to reinforce her appreciation of our visit. Tan Cuong is a small family run tea grower and seller north of Hanoi in the province of Thai Nguyen. Although we could not exchange words, she tried with her eyes and smile to express her warmth. When I asked could I take our photo, she proudly removed her headscarf, so as to look her best. 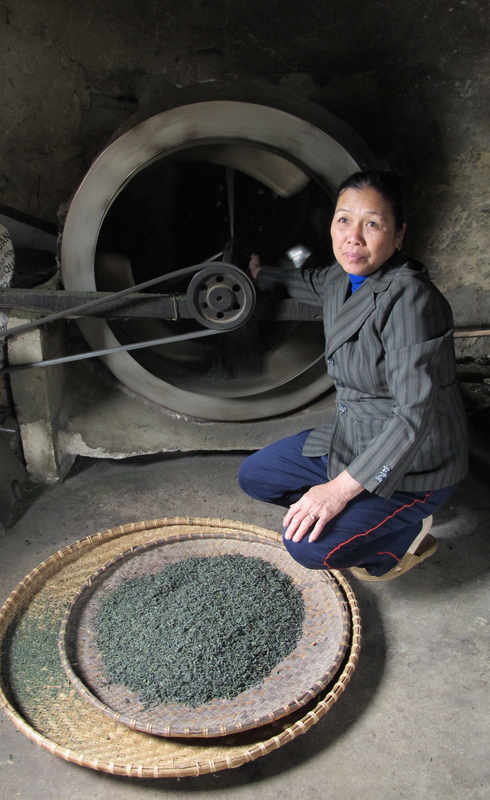 Drying the tea leaves requires a team effort, the dried leaves are placed into what could be considered a tumble dryer, but the heat is generated from burning in wood under a clay kiln, the tea leaves are placed in a metal drum and mother’s calibrated wise hand is placed in the drum monitoring the temperature and the speed, too hot and the leaves could burn and lose their flavour. This is the final stage drying; the tea has already gone through process of being handpicked, air-dried, crushed and kiln dried. It cost ten US dollars for half a kilo; it doesn’t seem much when you consider the amount of labour that’s required. This business does considerably better than other growers, as they have a good reputation and sell directly to the customer. 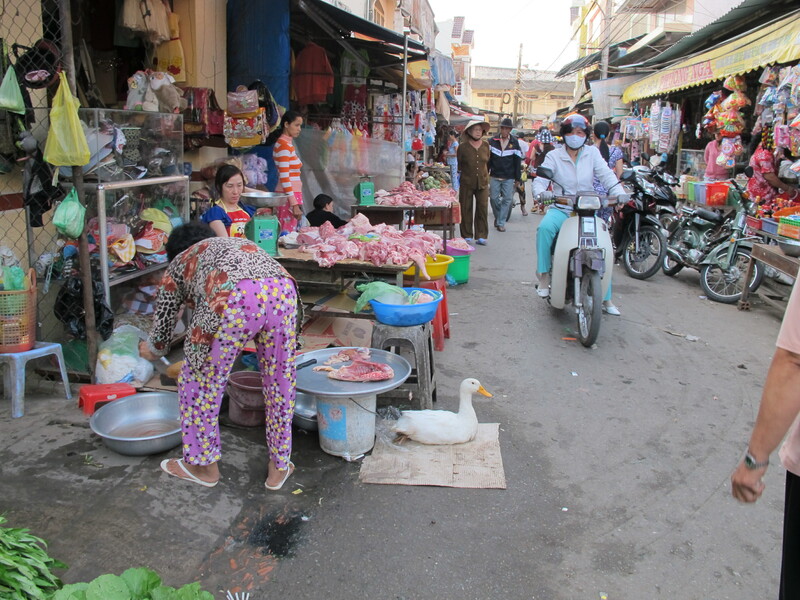 The street seller starts her day at 4 am, going to the market to buy the vegetables. She then walks the streets looking for willing buyers; a good day will finish at 4pm or 5pm but could go on till 7pm. In most cases, these women come from the countryside and share lodgings with ten other woman, earning maybe $20 in two weeks, some don’t pay much attention to who’s rich and poor, they are only focused on gathering enough money so that their children can have an education and a better life then them. The first day of the lunar New Year, I spent in the backpacker’s district across from ‘Alles Boo’ a club that was open throughout Tet. I woke at 4am to the loud lyrics of “find yourself, free yourself…boom boom” getting louder thinking I was in a middle of a rave. I went out to the balcony to see a mostly empty street, lone motorbikes taking wide circles on the corners. An old lady that was asking for money of the diners in the evening was still wandering the streets; her skinny frame suggesting she was without a family and home at this time of year. I remembered back to earlier in the evening and a woman who gave generously to her, she was possibly a professional companion, who was accompanied by middle-aged awkward looking client. She gave amply to all the lost souls looking for help, on this the first day of the lunar New Year. She vigorously ordered more beers and food much to her acquaintances disappointment, who was anxious to get on with the finale of the evenings arrangements. Her motives might have been that it wasn’t memorable at all, as she was without her family on this important first day of Tet. When you stay in the same place for a longer duration, it reveals patterns of movements and the tragedy behind the insincere smiles. A few days later I saw the same woman nestled under the arm of another customer, drawing deeply into her cigarette, she smiled back at the large haggard unfamiliar face, with just her mouth. The portrait on the wall, although looking like the first day of their marriage celebrated unbelievably twenty-fifth anniversary. It is a week before Tet and the couple had gone to the temple to pay off their debts, we had been invited by their daughter to share a nightcap. On meeting the couple in the flesh, the trials of life seemed more evident on their faces. We were the first westerners in their home, although they couldn’t communicate with us, they tightly shock our hands and offered to share with us their four-year old home fermented whiskey, made from corn and forest fruit. They robustly toasted us, encouraging us finish it in one gulp and wished us happiness and love and that we might have a successful marriage like them. The wife had recently won employee of the year and a bouquet of roses were proudly placed in the centre of the room. Her single daughter (our host) had returned to Hanoi after seven years in Saigon, at the age of twenty-six, changes the subject of marriage, as her mother inquires at every opportunity on her progress. Making these observations, I wondered were women any different on the other side of the world, in tropical heat, under different political systems, religions and histories? Do they still desire to be loved, admired and supported, worry about security, the dimpled skin on their thighs, the success of their children and the unspeakable, the condition of their teeth? Although we are in different contexts, the fundamentals for women don’t change very much. 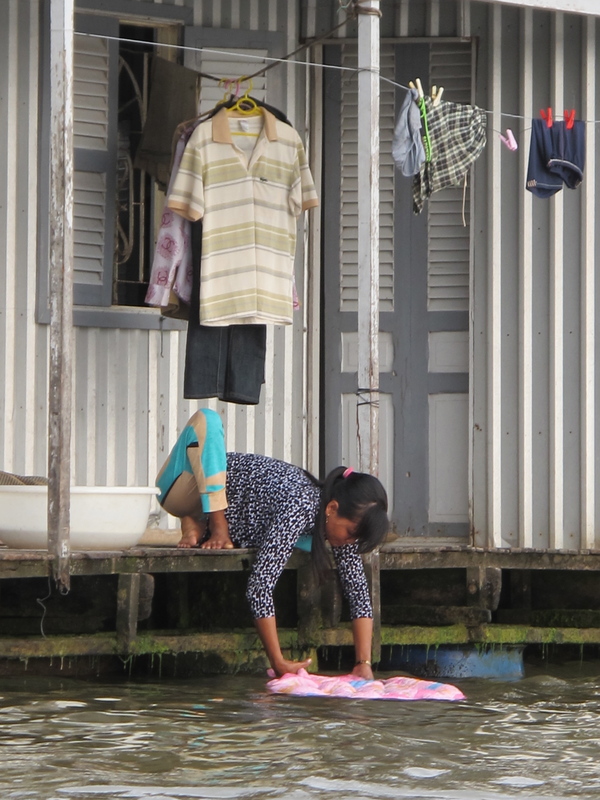 On our trip to the Mekong Delta, south of Saigon, we choose to do a home stay, to get more insights into the rituals of daily life. We were picked up by moped travelled into the setting sun. When we stopped at the traffic lights with the sea of other bikes, people looked at me curiously, wondering what was my relationship to my rather elderly driver. As he increased speed on the less congested roads, the dust began flying into my face, requiring we to put on my sunglasses making the passenger ride in the darkness even more terrifying. I was not able to anticipate when the bumps were coming in the road, my driver laughing as I clutched tighter going over the bumps. We stayed in the little village of Thoung Thanh outside the city of Can Tho. After sunset, we wandered the intimate narrow bucolic streets, where everybody seemed to know everybody. The men were finishing their celebrations for Tet, rubbing their bellies, with a collection of crushed cans under their table. There was a shop full of old-fashioned video games, an Internet café and a room full of cartons of eggs, with a bare-chested man walking around them. The local philosopher was sitting on a bench and greeted us by saying ‘Bonjour’. The local market was just finishing it’s day, with the last remnants been sold at the edges. 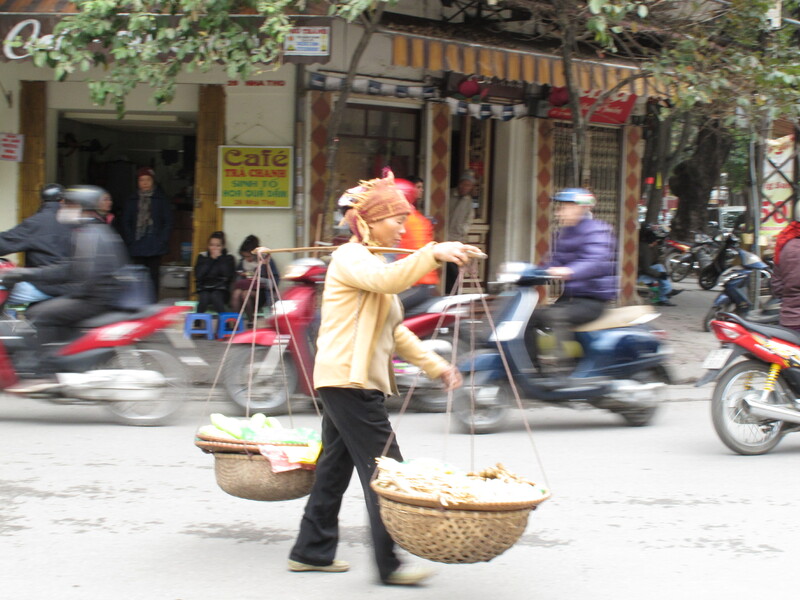 The local street chef was preparing tasty food on the corner while a pair of men gambled their winnings from Tet. Beating music rang from the men’s café and every household had a TV set flicking in the corner. We even heard the signature tune of ‘who wants to be a millionaire’, pretty easy in Vietnam, when you can buy a roll of bread for 5000. The women sat in groups and laughed and called out good morning to us, although it was pitch black outside. On a previous visit to another country farm, the Father of the house (who is a war veteran, now retired 10 years) says he’s bored and asks his nephew to get him a dartboard. His son is doing a PhD in South Korea and has sent him an electric blanket for the winter, but he doesn’t know how to use it, he finds it too cold to go outside, yet his wife of 70 was working the fields. They offered to kill a chicken and cook us dinner, we could have picked out the one we wanted to eat. Instead we fed them corn and grain; they preferred the corn and searched them out. Obviously, they don’t like to be picked up like pets, as they know the inevitable that follows. 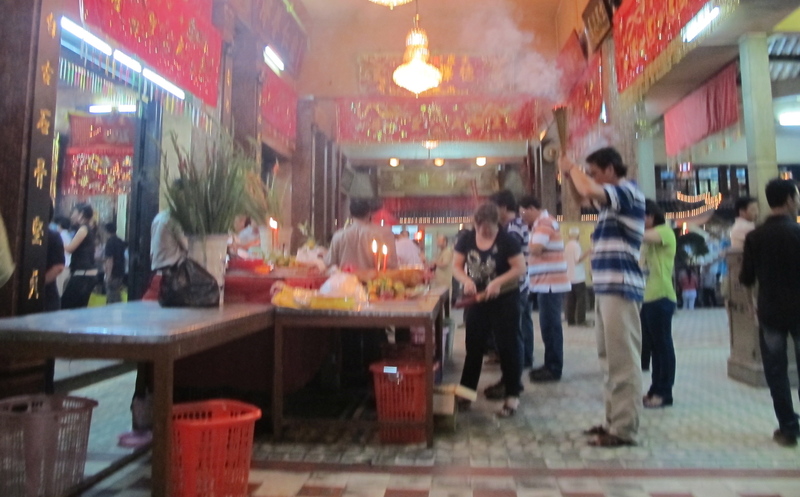 This entry was posted in Vietnam and tagged Customs, Rituals, Vietnamese Spirituality, Women in Vietnam. Bookmark the permalink.